On April 17, at 09:03 information was received to “911” service that a car accident had occurred in Burastan village, Ararat Province. The rescuers' help was needed. It turned out that “Jeep” car (driver A. 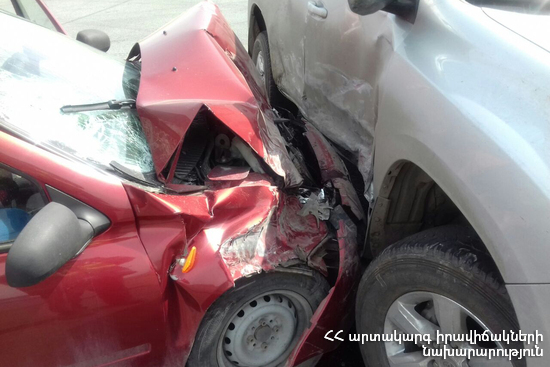 B. born in 1991) had run off the roadway and crashed into parked “Opel Zafira” (driver S. K. born in 1969) and “Opel Combo” (driver A. V. born in 1985) cars at the beginning of Azatavan village on the 15th km of Yerevan-Yeraskh highway. Before the rescuers arrived at the scene the passenger G. V. (born in 1978) of “Opel Combo”, the drivers of “Jeep” and “Opel Zafira” had been taken to the medical center of Artashat town. According to doctors G. V. was in fair and the drivers were in satisfactory condition. The rescuers disconnected the automotive batteries, closed the gas valves of “Opel Zafira” and “Opel Combo” and took cleaning up actions of the roadway.